How do German students learn about the Holocaust? How Do German Children Learn About the Holocaust? 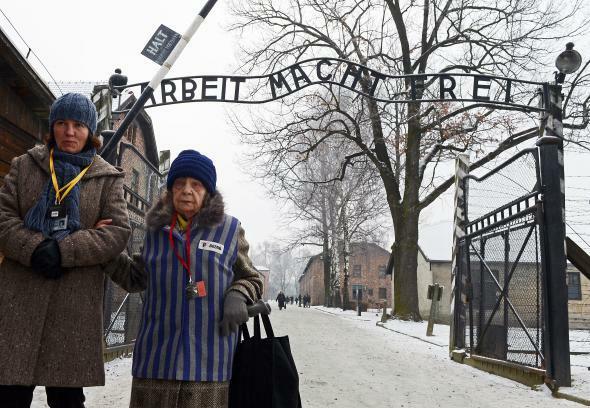 A former concentration camp prisoner, right, attends a ceremony at the memorial site of the former Nazi concentration camp Auschwitz-Birkenau in Oswiecim, Poland, on Jan. 27, 2014. I will make this one a little more personal because I understood the question to be aimed in that way. I was born in 1985, so it was the generation of my grandparents and great-grandparents who were alive during World War II. I think for me, there were roughly three stages of realization. Knowing there was some war in the not too distant past: I knew that my grandfather had been involved in a war, but that was something very distant for me. He only told the story how he had to ride a horse but was afraid of horses. The whole idea of war was not something I could understand at that time. But it was also clear from movies and stuff that Germany lost the war and that something horrible happened back then. Learning about World War II and the Holocaust at school: Overall, I think we learned about this time period at least three times. The first time the Holocaust came up in detail was in grade three or four, at the age of 9 or 10. The whole topic had a weird fascination for me because it made sense of a lot of small things in German culture, and finally we learned all about it. At the same time, I was horrified. I couldn’t imagine how people could believe these screwed-up ideas and do such horrible things in the name of these ideas. But it was a horror like I have for the witch trials and stuff like that. I didn’t make the connection between the war my grandfather fought and World War II. Later, we went to the Dachau Concentration Camp (as most schools around Munich do), and it was interesting and informative but not really disturbing. In Germany, the whole idea of “your own people” is not encouraged, and there is not a big feeling of unity (except if it’s about football/soccer). This anonymous answer tells you more about that. And when I saw these things that were taken from the prisoners (there is also one room just filled with hair), all the pieces came together in my mind, and I realized the first time on an emotional basis the whole horror. And I think I was not the only one. I found the toughest guy in our group, who would normally never show feelings, standing in front of a display cabinet with baby shoes crying. When the tour ended, we didn’t know how to look our Polish friends in the eyes again, because I think most of us felt unbelievably guilty as it was “our” grandparents who did that to “their” grandparents (together with many, many other innocent people). I remember us even talking about the fact that we were insecure on how to deal with that. Luckily, our Polish friends were pretty cool: When they saw us again after their tour and saw that we were all shocked and some still crying, they came up to us and told us that we shouldn’t be ashamed at all and that we are not responsible for the deeds of our ancestors. It took me a few years to get to the point where I could really feel that way, but I got there. And that is how I feel today about it. The Holocaust was horrible, and I think as a country, we have the responsibility not to forget about it and also to do what we can to let something like that never happen again. But personally I think I am not different from any other person on this planet: able to do the best and the worst. And it is my own responsibility what I make of that; for that, it doesn’t matter what my grandfather has or has not done. Of course it would be nice to have ancestors I could be simply proud of, but in the end, who can? Every country has dark spots in history; ours just happen to be huge and pretty recent. How do Germans today deal with their Nazi past? What are the most unexpected/shocking/baffling things people encounter when visiting Germany for the first time? Correction, Feb. 6, 2014: This post originally contained two images from the Auschwitz-Birkenau State Museum that were attributed to the author. The photos were not taken by the author and have been removed.